Mark Devereux Projects invites applications from artists for Dialogues 5; a new project providing tailored critique and mentoring for five visual artists. The selected artists will take part in a structured creative retreat aimed at improving critical discourse within their practices. Following this, Mark Devereux Projects will carefully match each artist with their own curatorial mentor who will offer tailored, high quality critique of the artist’s practice through studio visits and ongoing conversations. Concluding the project, each artist will be invited to present new work as part of a group exhibition(s) and accompanying artists’ talk event. Dialogues 5 aims to reach artists with a range of practices and artistic approaches, bringing together individuals from across the UK from all backgrounds. The five selected artists will spend three days dissecting, questioning and enhancing their artist voices through critical conversation and collaborative learning. Accommodation, food and refreshments will be provided and all participants will be required to attend. Mark Devereux Projects will carefully match each artist with a specialist curatorial mentor actively working within the sector, receiving one 3-hour studio visit and one 1-hour Skype follow-up session. 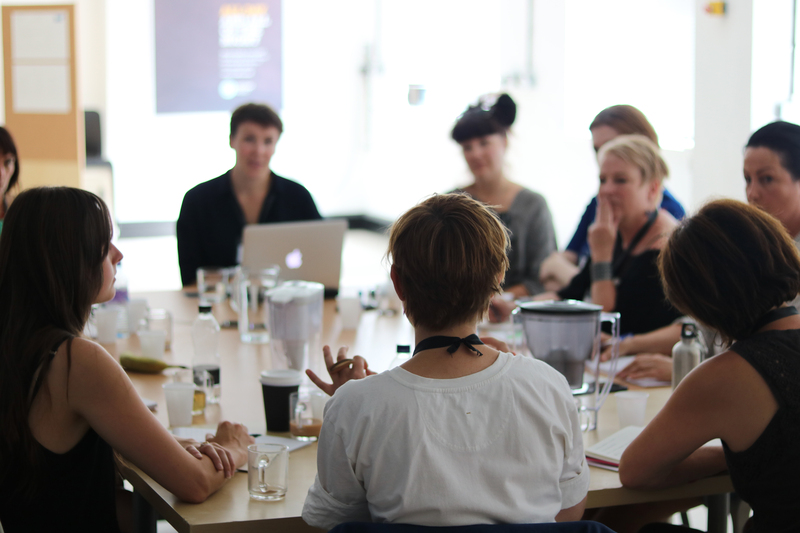 Provisional curatorial mentors include; Fiona Bradley (Director, Fruitmarket Gallery), Charlotte Gregory (Director, The NewBridge Project), David Kefford & Sarah Evans (Aid & Abet), Claire Mander (Director, theCoLab) and Nathaniel Pitt (Director, Division of Labour). The selected artists will also receive ongoing critique, studio visits and mentoring from the Mark Devereux Projects team throughout the 7-month programme. The project will culminate in a group exhibition(s) / event presenting new work by the selected artists. The venue for this will be confirmed dependent upon the requirements of the selected artists – provisional venues include; Division of Labour (London), The NewBridge Project (Gateshead) and Regent Trading Estate (Salford). The selected artists will be invited to give a short artist talk / presentation as part of the final outcome. Dialogues 5 costs approximately £4,000 per artist to deliver. Thanks to funding from Arts Council England and other partners the total cost to each artist will be £240 for the 7-month programme. The cost of the programme can be paid in full or in monthly instalments and payments will be made to Mark Devereux Projects who are coordinating the programme. Please note that additional travel costs will apply in addition to the fee. Mark Devereux Projects will support selected artists with any individual fundraising applications. Costs for the programme apply to successful applicants only – there is no charge to apply. Dialogues 5 is open to UK-based artists working in any art form. While we are keen to support a variety of practices we strongly welcome applications from artists that have been out of undergraduate education for approximately 5 years. We aim to select a diverse range of artists that are dedicated to the development of their practices and show a desire to undertake intensive critique through one-to-one and peer learning activities. The selection process will be decided by a panel assessing the quality of work and the potential impact Dialogues 5 would have on each artist’s respective practice. Applications may be made via video or audio to support those with dyslexia. Please note that any applications not including the information requested will be ineligible. Please send your completed application via WeTransfer to: admin[at]markdevereuxprojects[dot]com. We will acknowledge your response within 3 working days. The deadline for applications is 5pm Sunday 29 April 2018. All applicants will be notified by 4 May 2018. Shortlisted artists will be invited for interviews taking place in Salford or via Skype w/c 14 May 2018.